Leonard Covello was born in Avigliano, in Southern Italy, in 1887. His father immigrated to New York City soon after and was joined by Leonard, his mother, and his brother in 1896. They settled in East Harlem, which Meyer (2010) calls “a community of original settlement, whose housing was constructed specifically for immigrants.” He further characterizes turn-of-the-century East Harlem as a highly homogeneous neighborhood with poor housing conditions, tremendous overcrowding, and a low level of literacy. He also writes that his original name, Leonardo Coviello, was changed to Leonard Covello by one of his teachers at the Soup School. These were important experiences for Covello as he learned to adapt to a new country and a new culture. 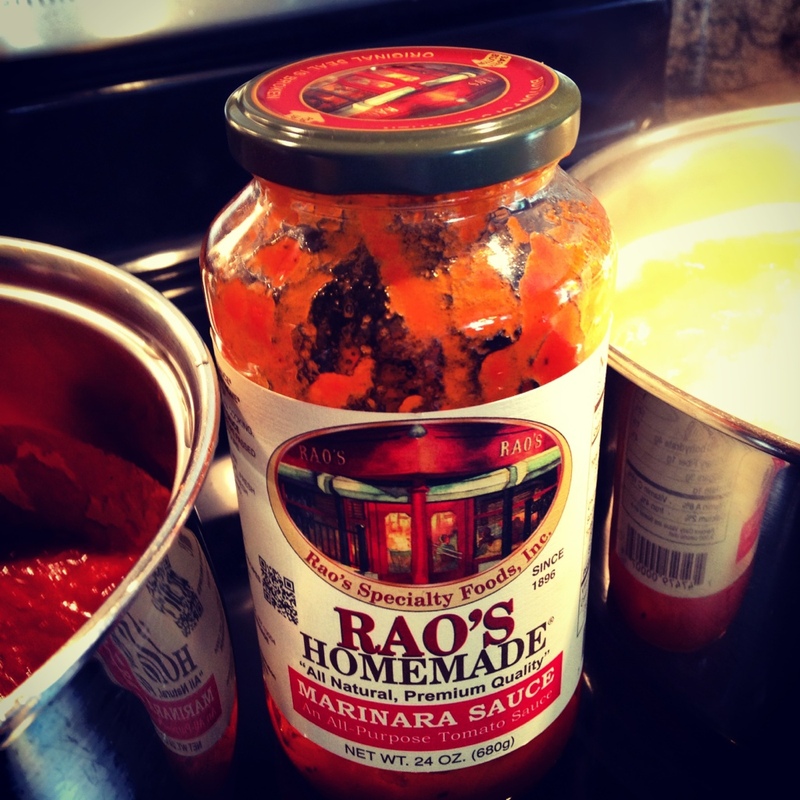 One could argue that his later emphasis on student voice and the preservation of Italian culture and heritage represented an oppositional response to his own experiences growing up. Covello (1958) talks about the almost exclusive use of memorization and drill as the ways to teach and learn in the various public schools he attended. Again, the fact that at BFHS he emphasized discussion, interdisciplinary work, and critical questioning can be seen as a reaction against the way he was educated. He describes how “[t]he constant drilling and the pressure of memorizing, the homework, and detention raised havoc with many students” (Perrone, 1998, p. 95). Covello used this life experience as a basis for his work not only as an educator and school leader, but also as a community activist and an ethnographer. At DeWitt Clinton High School (Clinton), where he taught from 1911 to 1917 and again from 1920 to 1934, Covello developed the philosophy and leadership skills that he would later employ at BFHS with such success. As Meyer (1989) puts it, “Covello began to implement strategies for improving Italo-American high school students’ achievement by alleviating, if not eliminating, the conflict between the ethos of American educational institutions and the adapted Southern Italian mores” (pp. 10-11). Meyer argues that this initially took three forms: promoting the study of Italian; organizing Circoli Italiani (Italian student clubs); and founding the Casa del Popolo, a settlement house in East Harlem. Through this growing understanding of what an academic department could achieve vis-à-vis an immigrant community, and the idea that schools should concern themselves with the life conditions of their students through research, action, and personal involvement, Covello set the stage for the work he would later do at BFHS on a much larger scale. While still at Clinton, Covello began to initiate and become involved in a variety of interrelated activities and groups—both in school and in the larger community—that promoted Italian culture, the improvement of intercultural relations, and developing leadership in his students. 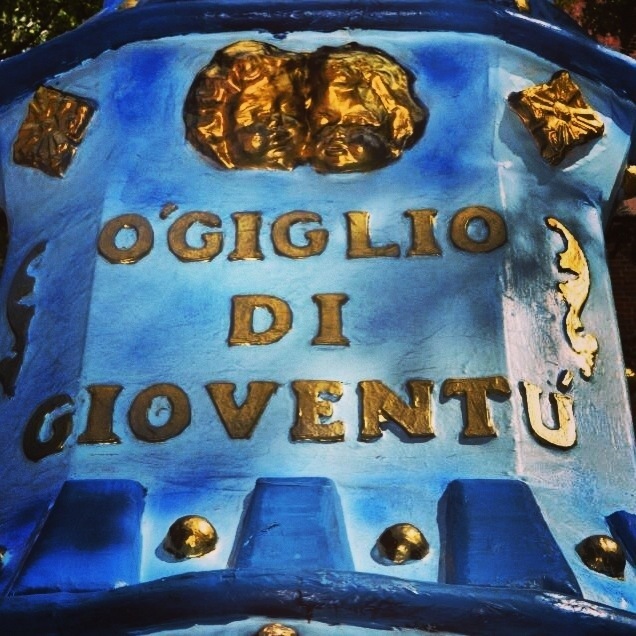 One such group, as mentioned earlier, was Il Circolo Italiano, a language and service club which Covello founded in 1914 with the student leadership of Benjamin Segreto. According to Meyer (2010) Il Circolo Italiano’s stress on teaching Italian and promoting an understanding of Italian culture had two major goals: overcoming Southern Italian immigrant parents’ misgivings about prolonging the education of their children, and providing the community with strong leadership. Il Circolo Italiano served as a means to develop student leaders through its emphasis on social service. Students were involved in many aspects of settlement house work, such as teaching English to immigrants and working with younger children in various programs. 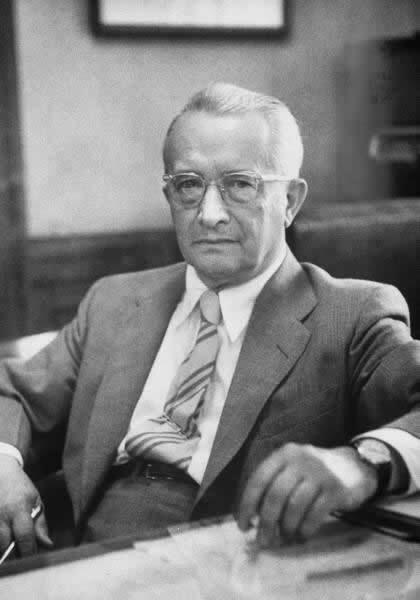 As a result, “The boys who served as leaders of this club during the twenties were dynamic and talented, most becoming successful professional individuals in teaching, government, medicine, and law” (Peebles, 1968, p.135). In 1927 Covello began a collaborative project with the Boys’ Club of New York which led to a community study of East Harlem. This work was critically important to Covello’s development as a researcher and socio-community ethnographer who understood the connections between community, culture, and education. 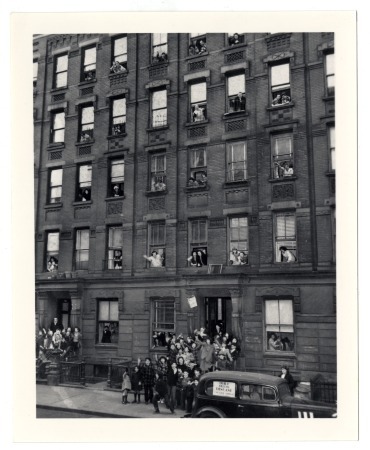 In the early 1920s Covello was also directing a settlement house in East Harlem called the Casa del Popolo. Meyer (2010) describes the Casa del Popolo as a place that provided both English and Italian language instruction, thereby supporting both cultures. 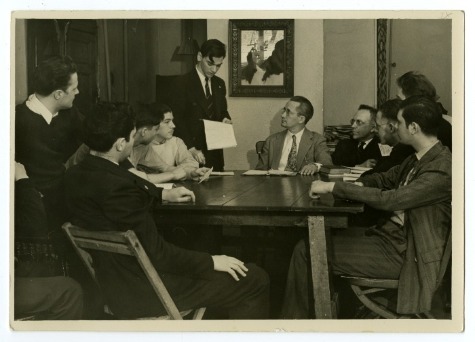 (Vito Marcantonio, a student—and later, friend and ally—of Covello’s, who went on to serve as East Harlem’s congressman for many years, taught La Casa’s citizenship classes.) In his work at Casa del Popolo, Covello served the needs of his community in numerous interrelated ways. He taught and counseled students and worked with their families. At the same time, he was overseeing a number of social action programs that served these groups, researching their lives and needs in detail, and creating opportunities for grassroots community leadership. In addition, in 1932 Covello organized the Casa Italiana Educational Bureau. Cordasco (1975b) examines this endeavor at length. 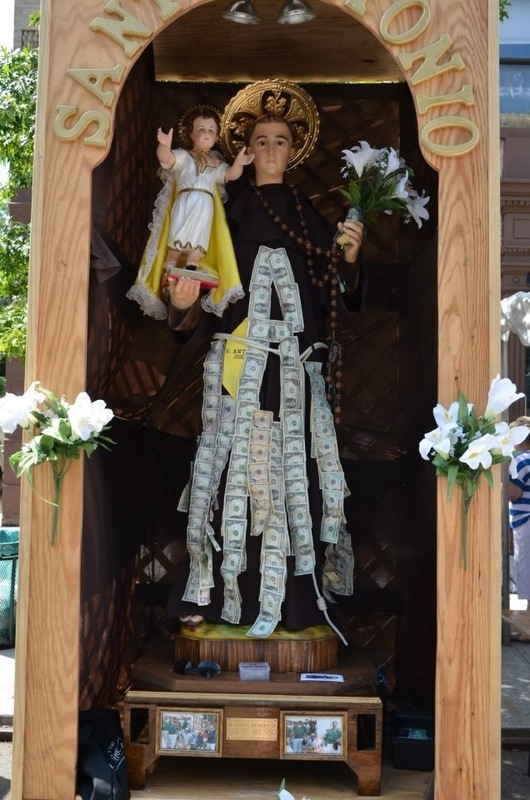 He writes that it was “[h]oused in two small rooms at the Casa Italiana, [and] its financial support derived from the Federal Writer’s Project which had been set up by the United States Government as part of the Works Project Administration…” (p. 2). It is important to note the WPA’s relationship to the Casa Italiana Educational Bureau, since the WPA would later support other aspects of Covello’s work as well. According to Cordasco, the Casa Italiana Educational Bureau had three major purposes: to be a fact-finding organization; to centralize efforts that would support the social and cultural advancement of Italian Americans; and to organize and implement a program that would promote educational and social activities (p. 3). 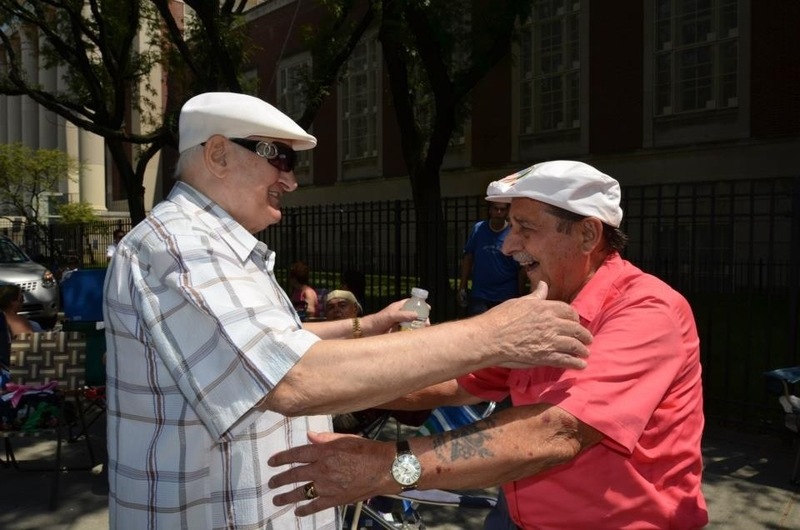 Here we can again see both Covello’s focus on an integrative approach and his developing vision of how schools and related organizations would serve the Italian American community. In a bulletin he wrote in 1933 concerning the Casa Italiana Educational Bureau, Covello observed: “The need for unification and coordination of all kinds of educational work in Italian-American communities is therefore a pressing matter. The policy of drifting and of shortsighted opportunism has been all too dominant in shaping the direction of Italian-American community life” (Cordasco, 1975b, p. 3). Like much of Covello’s work, this accomplishment was both organic, growing naturally from his long relationship with Marcantonio, and consciously organized, a result of careful planning and effort. Perrone goes on to note the importance—exemplified by Marcantonio’s participation in the presentation ceremony—of giving students real responsibility and asking them to consider important social problems. Both of these points are key: first, both Covello and Marcantonio represented what Peebles (1968) calls indigenous leadership in their community and stayed there throughout their lives; and second, not just their fellow Italian Americans, but also people of all backgrounds, were included in their vision of community and social justice. After his retirement from BFHS, Covello continued his work as an educational and community leader, with a particular focus on Puerto Ricans and other immigrant groups. He was an educational consultant to the Migration Division of the Department of Labor of the Commonwealth of Puerto Rico and a leading figure in the East Harlem Day Care Center for adults. Covello moved back to Italy in 1972, where he served as a consultant to the Danilo Dolci Center for Study and Action in Sicily. He died in 1982. Lost, but not forgotten…Morrone’s Bakery. Morrone Bakery, once located at 324 East 116th Street, sold Italian, French and Semolina bread. 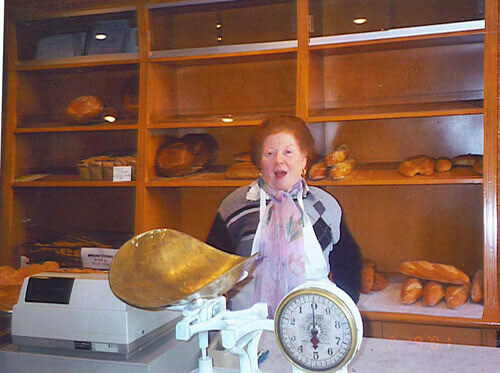 Gabriele and Rosa Morrone opened the bakery in 1956 and until closing day, they religiously made authentic hand-made breads. This tiny bakery offered a homely, welcoming atmosphere, with Rosa Morrone wrapping and selling the breads herself. Long gone…but never forgotten! 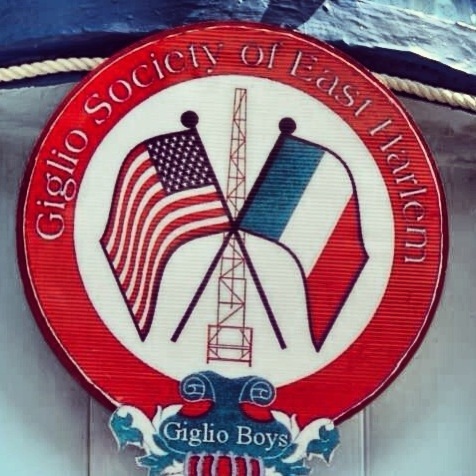 East Harlem’s Festa di Giglio-2014! 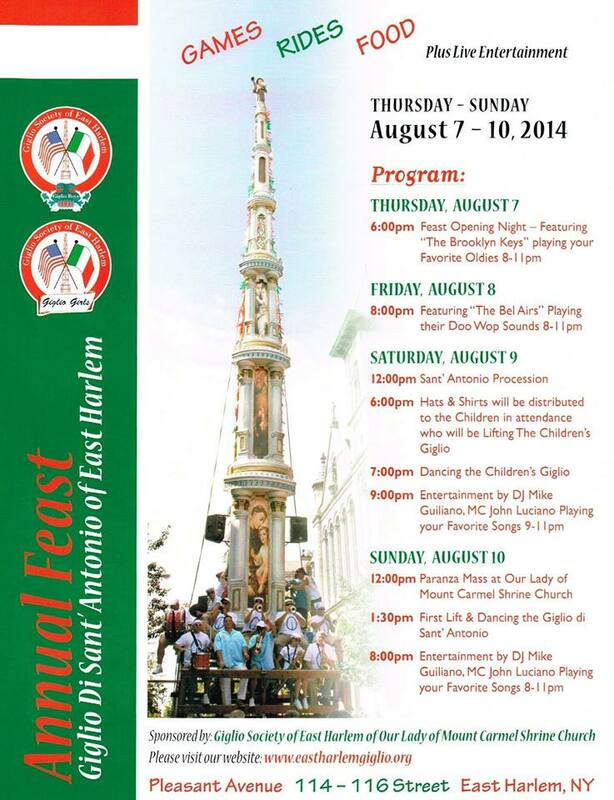 EAST HARLEM’S FESTA di GIGLIO di SANT’ANTONIO, AN EVENT NOT TO BE MISSED!